The second season of The Muppet Show on DVD still doesn't have a release date, but I'm told that they've now stopped chasing clearances and the final edits - the odd song missing - are to be locked. It's a shame that so many TV shows on DVD suffer from copyright issues surrounding their musical content, but it's less forgivable when musical content is ditched simply to save costs - some shows, for example, only feature the theme music on a handful of epsiodes of their DVD sets to cut down on expense. Best move? Go for a buyout deal when negotiating theme tunes in the firstplace. 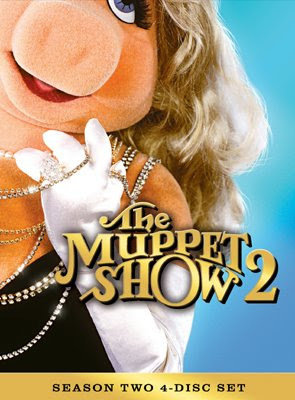 The below cover art was chosen after a vote on the official Muppets website. Earlier in the week, Jim Hill Media published a great piece that gives details of many future Muppet endeavours. I'd recommend popping over to read the whole thing. Hey, Brendon, absolutely love this site, and I love how you've usurped AintItCool as my go-to site for movie news. I also love how, when you talk about your love for a film, you manage to leave out every single detail of your day leading up to your experience, but I digress. Just a quick note on the whole music-being-cut-from-DVDs thing; you make an EXCELLENT point regarding the buyout option. This is, in fact, what the particular large entertainment company I work for does as standard practice NOW, but even up to one year ago, that was not standard practice. Especially with older properties--music licensing back then was sort of an afterthought, or at the very most wasn't done with much of an eye for the future. There were options, sure, but Buyouts are big money and they're not willing to pour the resources into something that might not have legs down the line. Also, since I'm actually in the Music Licensing profession at the moment I can tell you, we are told to dissuade productions (especially nowadays) from using third-party music whenever possible. You want "Born To Be Wild"? How about this track from a Production Music Library called "Birthed To Be Crazy? We have a deal with them." But the bottom line is--if something doesn't have a certain built-in audience and more-or-less guaranteed sell-through, they're not going to pay top dollar for a particular song that can be replaced. Just to give you an idea of numbers: let's say you want to use The Monkees' "I'm A Believer". If you want the Monkees actual recording, you're paying Master AND Sync rights, and for an All Media Buyout, that's going to cost you--and this is not an exaggeration--upwards of $50,000. I know, you're saying, "So what? Can't Huge Entertainment Company X afford that?" Sure they can. But they'll also have to pay for all the OTHER songs used in the same property, let's say an average of ten. At those prices, you're then looking at $500,000 JUST in Music Clearance costs, not counting footage or SAG/AFTRA deals. And on properties that MIGHT sell 35,000 copies, they're not going to pay for all those clearances (Bump-Ups, in the case of older properties), they're just going to cut it. Oh, and if you have a musical performer who's still on a label--let's say Cher on The Muppets (if that's the case), then you ALSO have to pay for a Blocking Rights Waiver, which is the artist's label getting paid for us to use their contracted performer in one of their productions. That could tack on another $50,000.